For more information and photos of lodging, click here. For more information about meals, click here. A NOTE on MEALS: Please let us know your meal preferences and dietary needs on the registration form below. Hotel style rooms are located inside the main building where training is held. There is WIFI access on site. Cabins rooms are located in a few buildings, and have common living room and shared baths. Cabins are a short walk from the main building. These rooms do not have reliable access to WIFI. How can I feel centered and clear with how I respond to what’s going on in the current social and political climate? Can I engage in the world in a way that’s empowering, not motivated by fear, anger or judgement? HEART on! An opportunity to immerse yourself not only in a new way of thinking but in a radically different way of being. "Compassionate Communication helps me bring my inner world into the relational world. I want to connect to life as it flows through me so that I can connect to life as it flows through you. It is the same life." ~Robert G.
Why is a retreat important for the practice of living compassion? 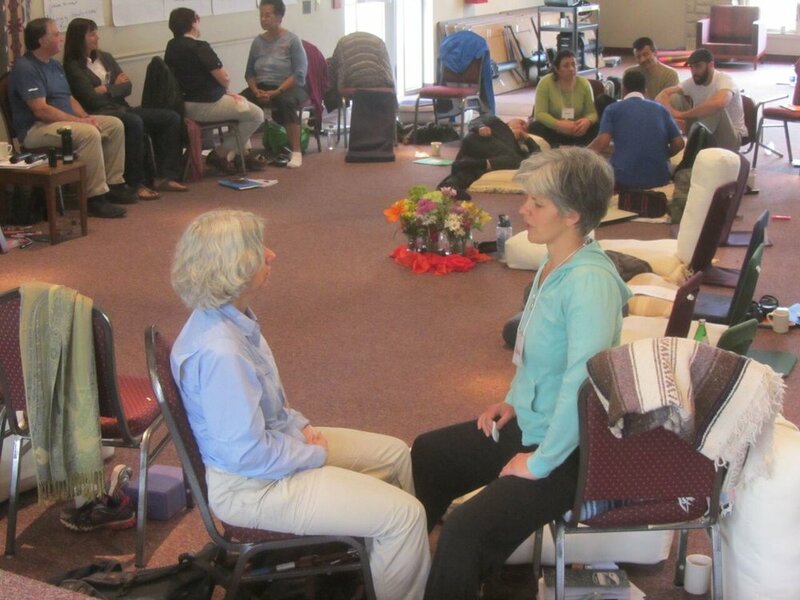 In this Intensive, Robert Gonzales will present practices he has developed over 30+years of teaching Nonviolent Communication (NVC) and from his personal, self-exploration into how to live with compassion moment–to-moment in any and every situation that arises. How will the retreat be structured? Each day will include: group opening and closing circles, lecture presentations, process demonstrations with time to practice, dyad meditations, and guided group sessions. There will also be silent times for integration using visual art expression, journaling, and walking meditations in nature. What teaching topics and practices will Robert focus on? What skills will I work on developing? · Creating a support network. With intention and practice you will be able take the consciousness of Living Compassion into our “outer” world, and share with others a way to live life that is empowering and fulfilling rather than reactive and disempowering. "To fully empower our place in life, our engagement in life, we must first find, cultivate and strengthen the center from which we engage with life. The center where our values lie, our heart center, the center of life force energy as it flow through us. When we act from our center, fueled by love, we start to harness a force that is beyond what we’ve as far known as possible." Robert G.
Robert Gonzales received a Ph.D in Clinical Psychology in 1989. He met Marshall Rosenberg in 1985 and has been offering NVC since 1986. After serving multiple roles with the Center for Nonviolent Communication Robert founded a center, which evolved into the Center for Living Compassion, a nonprofit organization through which he shares his work. STEP 1. Complete registration below. Step 2. Complete Payment Section: NOTE- this is a 2 part process, as Tuition and Room and Board have several choices. Select Tuition option, add to cart, then select 'continue shopping' to come back to drop down menu to add Room an Board option to shopping cart. Complete payment through Paypal. If you have questions about any part of the registration process, please contact us at any time.